The ship is identified by the name Lyra within a cartouche on the stern. The Lyra was commanded by Captain Albert Cheever, 1818-1898. Born in Castine, Maine, he commanded the Lyra to India, China and other ports. He lived in Newburyport, Massachusetts where he joined the local Marine Society in 1856. After he retired from the sea in 1873, he served as the society’s vice president and president from 1884 to 1895. It was customary for sea captains to have portraits of their ships commissioned in various ports – from Europe to South America to Asia. 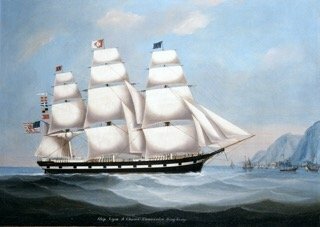 One of the most common and popular views was to have one’s ship depicted under full sail as it entered the port of Hong Kong (“Fragrant Harbour”) which opened to trade in 1842 and quickly became the center of European trade with Asia.